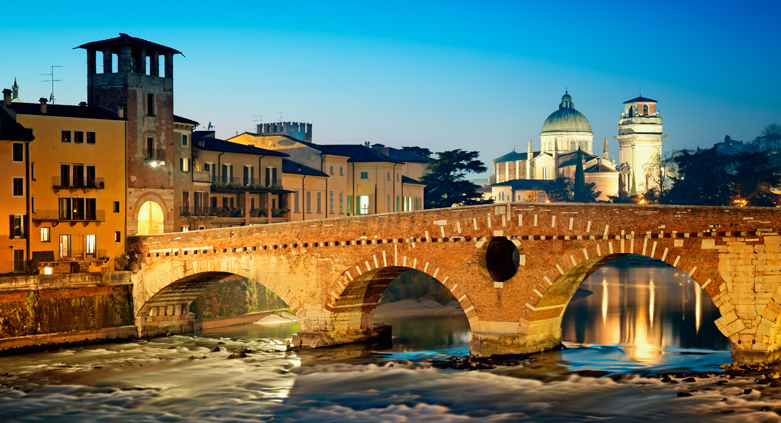 Welcome to ‘magna Verona’, this is the name given 2000 years ago to our city because of its importance and size. Three consular roads met here and connected the heart of the roman empire to the world of the Gauls and the germanic populations. Here you will admire the wonderful stone amphitheatre, famous worldwide, called Arena. Verona is the home of the poet Catullus and Julius Caesar also was a frequent visitor; here Constantine won the battle enabling him to convert Rome and the whole world to Christianity; in this city the last emperor of the Western Roman Empire was dismissed, here the ancient times ended and the Middle Ages began. We start our tour in front of the Arena, masterwork of roman engineering and symbol of the city. 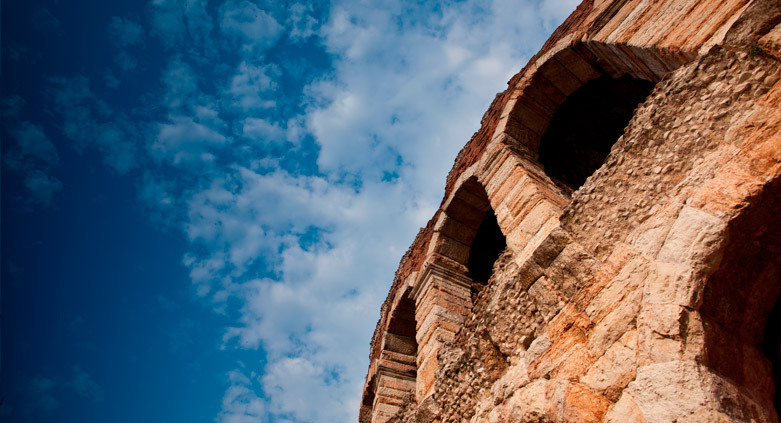 Its history spans 2000 years: from roman times, when the gladiators fought for their lives, to the present use of the amphitheatre as an open air theatre for opera performances. A visit inside the Arena is a must! The past will envelop you… you will imagine being a roman citizen rooting for your favorite gladiator or bowing at the entrance of the emperor. Lets now walk along the Cardo and Decumano: at the meeting point of the two main roads of the roman city we find the Forum, today a lively market called Piazza delle Erbe. The temple dedicated to the Capitoline Triad was here, a building rarely seen outside Rome and the statue of Minerva, nowadays called Madonna Verona to be visible in the centre of the square, is proof of the existance of the temple. 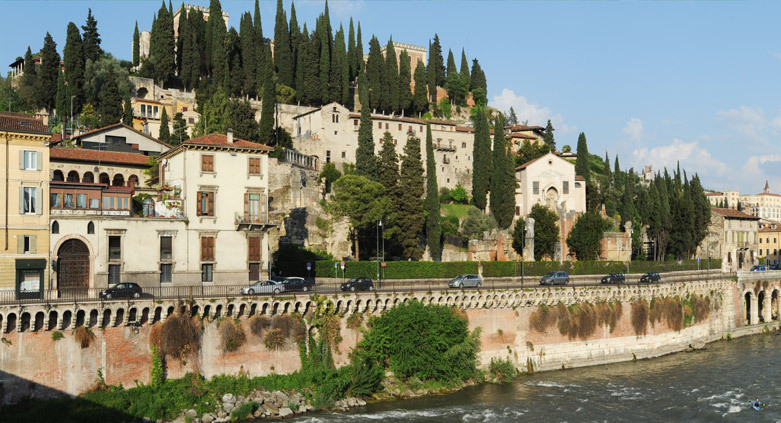 Now we stroll along the narrow streets and through the courtyards to observe the many still visible parts of roman Verona and this walk leads us to the Roman Stone Bridge: it is the oldest roman monument of Verona and the view towards the Roman Theatre, built well before the Arena, is awesome. This part of the city is magical: from the bridge you can look in all directions:the river, the hills, the colours of brick and stone blend together and leave you speechless. As we return towards the Arena you will discover other corners, mostly unknown to most visitors, such as Porta Iovia and Porta dei Leoni or the remains of the city walls of Emperor Gallieno. TO COMPLETE YOUR DAY: the Roman Theatre, the Archeological Museum, the Museum of Excavations, the ruins of the roman villa in Piazza Nogara (advance reservation necessary).